Bob Carr does his Corbyn impersonation. Of course the real story about the Spanish Civil war "veterans" was when the Soviets signed a pact with the Nazis they all opposed fighting Hitler. See also Pete Seeger. Thank you, Daphne, for the hat tip reference. 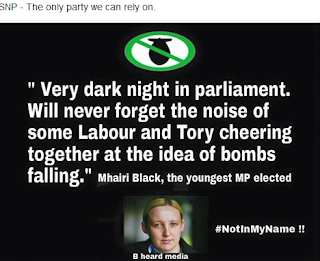 I noted in the comment to the article below this one that Benn had reminded his party of its proud anti-fascist and anti-appeasement past. While there were plenty of Conservative politicians (and many aristocrats) prepared to treat with Hitler and weren't bothered about how short the spoon was with this devil, Labour politicians and trade unions were fighting Mosley in the streets and the Nazis in any way they could (including fighting in Spain against Franco). 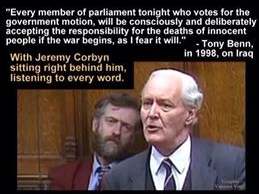 Benn called ISIS/Daesh what it is: fascist. If you go to the last 3 or 4 minutes of his speech, he says all this and more. It was the speech of a statesman. I just hope he gets the reward hw deserves!